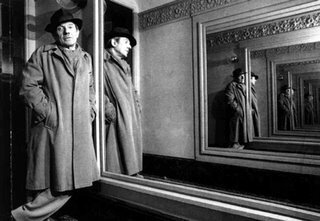 I was flipping through Deleuze’s books on cinema this morning, with cinema, not literature, on my mind. But this just leapt out at me. We know that there’s a connecting line between Thomas Pynchon and Gilles Deleuze. And Against The Day, like his previous novels, is at times incredibly cinematic (in a sort of impossible way). So check these passages out. They deal with the kinds of films that create worlds. Deleuze uses philosopher Henri Bergson, whose ideas on the relationship of Past and Present to Time map well to film (since each film creates a strip of its own time, and can create movements through time within itself: flashbacks, dreams, parallel times, etc.). Deleuze describes these cinematic worlds as crystals, each having a kind of genetic purity, or organizational structure. What grabbed my attention were the numerous similarities between the role Iceland Spar plays in the book and this description of the crystal image. The notion that the characters have an actual and virtual image corresponds with the book’s constant population of ghosts, the doubling, the bilocations, deja vus, and so on. Even the references here to mirrors, and the Venetian mirror and multi-sided mirors is particularly weird. The Serpent, postcard, Augustinian Illumination are even mentioned! If we take this direction to its limit, we can say that the actual image itself has a virtual image which corresponds to to it like a double or a reflection. In Bergsonian terms, the real object is reflected in a mirror-image as in the virtual object which, from its side and simultaneously, envelops or reflects the real: there is ‘coalescence ‘ between the two. There is a formation of an image with two sides, actual and virtual. It is as if an image in a mirror, a photo or a postcard came to life, assumed independence and passed into the actual, even if this meant that the actual image returned into the mirror and resumed its place in the postcard or photo, following a double movement of liberation and capture. But here we see that the opsign finds its true genetic element when the actual optical image crystallizes with its own virtual image, on the small internal circuit. This is a crystal-image, which gives us the key, or rather the ‘heart,’ of opsigns and their compositions. The latter are nothing other than slivers of crystal-images. The crystal-image, or crystalline description, has two definite sides which are not to be confused. for the confusion of the real and the imaginary is a simple error of fact, and does not affect their discernibility: the confusion is produced solely ‘in someone’s head.’ But indiscernibility constitutes an objective illusion; it does not suppress the distinction between the two sides, but makes it unattributable, each side taking the other’s role in a relation which we must describe as reciprocal presupposition, or reversibility. In fact, there is no virtual which does not become actual in relation to the actual, the latter becoming virtual through the same relation: it is a place and its obverse which are totally reversible. These are ‘mutual images’ as Bachelard puts it, where an exchange is carried out. The indiscernibility of the real and the imaginary, or of the present and the past, of the actual and the virtual, is definitely not produced in the head or the mind, it is the objective characteristic of certain existing images which are by nature double. Hence two orders of problems arise, one of structure, the other of genesis. First, what are these consolidates of actual and virtual which define a crystalline structure (in a general, aesthetic, rather than a scientific, sense)? And, later on, what is the genetic process which appears in these structures? The most familiar case is the mirror. Oblique mirrors, concave and convex mirrors and Venetian mirrors are inseparable from a circuit, as can be seen throughout Ophuls work, and in Losey, especially in Eve and The Serpent. This circuit itself is an exchange: the mirror-image is virtual in relation to the actual character that the mirror catches, but it is actual in the mirror which now leaves the character with only a virtuality and pushes him back out-of-field. The exchange is all the more active when the circuit refers to a polygon with a growing number of sides: as in a face reflected on the facets of a ring, an actor seen in an infinity of twins. When virtual images proliferate like this, all together they absorb the entire actuality of the character, at the same time as the character is no more than one virtuality among others. This situation was prefigured in Welles’s Citizen Kane, when Kane passes between two facing mirrors; but it comes to the fore in its pure state in the famous palace of mirrors in The Lady from Shanghai, where the principle of indiscernibility reaches its peak: a perfect crystal-image where the multiple mirrors have assumed the actuality of the two characters who will only be able to win it back by smashing them all, finding themselves side by side and each killing the other.